Self-employment has risen substantially since the ACA took effect. The economy added 215,000 jobs in March, with the unemployment rate rounding up to 5.0 percent from February's 4.9 percent. However, the modest increase in unemployment was largely good news, since it was the result of another 396,000 people entering the labor force. 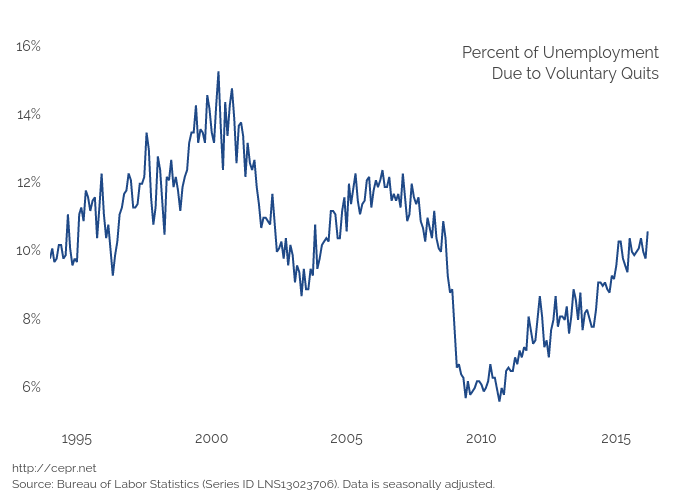 Another positive item in the household survey was a large jump in the percentage of unemployment due to voluntary quits. This sign of confidence in the labor market rose to 10.5 percent, the highest level in the recovery to date, although it's still more than a percentage point below the pre-recession peaks and almost five percentage points below the peak reached in 2000.